Encore! graduates. Today is the first day of junior high. Encore! receives a new grown-up snaffle bit and KL reins. We are all a match in black saddle, pad, bridle and reins. Encore! is handsome in her tasty copper-inlaid-snaffle bit and ultra- soft- light-weight reins. Being new, the reins and bit outshine the rest of the tack. Little by little we upgrade our closet. How does Encore react? Not a bother in the world. She takes to her fashion advancement naturally. I am the one who needs to adjust to the new reins. Up to now, we have worked with long-white-western-style-soft-woven-nylon-cotton-blend reins, which have served us well. I can wiggle these reins, with flaps at the end, to move Encore! forward when she sees or hears something that concerns her, and she hesitates. Now, I carry a whip to reinforce her courage and cooperation. I tap her hind end to keep her engine moving forward should she resist a request. Nothing punishing here, only light rhythmic taps to focus her attention to the job at hand. She is ready for this whip upgrade. I always prep Encore! before doing something new. I put the whip in the two small metal rings on the top of the surcingle. The whip waves up and down while Encore! trots and canters, in long-lines, on the circle. I switch the whip into each ring, so the whip can wave on both sides. Voila! She is safely desensitized and ready to show off her latest accessory. We always finish our work with a trail ride out or a walk around the property. Encore! is responsive and forward. 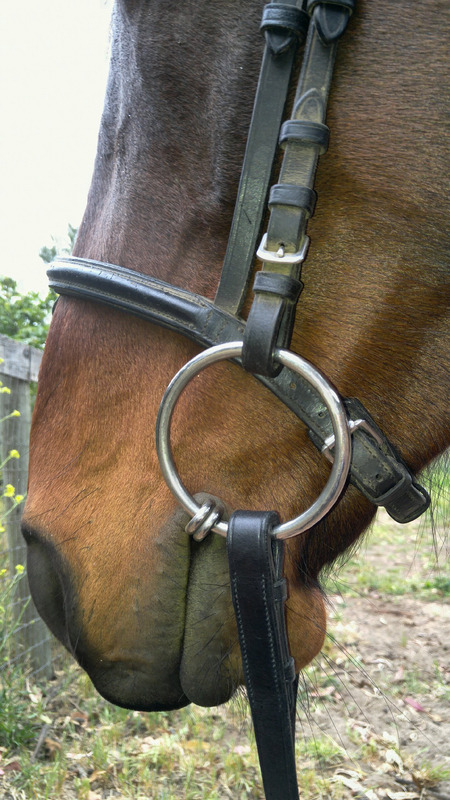 The reins coil at the buckle and rest on the side of her neck. The old reins were split. These new reins are two pieces joined together into one rein with a buckle. These new reins feel like they are barely there which in turn lighten my hands and make me rely more on my seat and legs. My legs are like arms stretched around Encore! My “arms” are equally ready to hug, release or push depending on the need. My goal is to have my seat and “arms” delicately cue Encore! like a dance partner, or a ceramicist that molds a clay pot with the lightest touch. Ah. . . to waltz across the countryside with Encore! enjoying the music of the great outdoors is a supremely satisfying idea.